Deforestation causes more global warming pollution than all forms of transportation combined. A single forest tree absorbs 26 pounds of carbon dioxide per year, an acre of trees can remove 2.4 to 5 tons of carbon dioxide per year, and there are 728 million forested acres in the United States that remove more than 1.7 billion tons of carbon dioxide per year. 50-75% of the pulp used to make toilet paper comes from old growth forests, which are valuable ecosystems and also play a huge role in absorbing CO2 from the atmosphere. Americans consume more paper than any other country on earth. 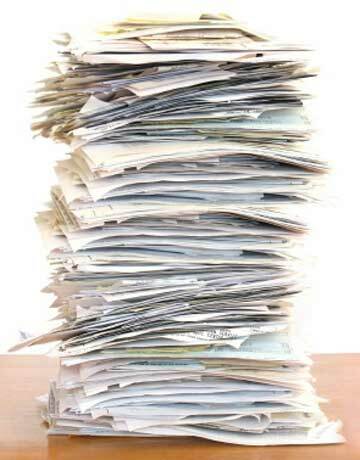 Each American, on average, uses 741 pounds of paper per year. Furthermore, The United States is the largest market for toilet paper, and only 2% of sales are from 100% recycled toilet paper. In addition to contributing to the detriments of deforestation, the pulp and paper industry is the third largest industrial emitter of global warming pollution (coming in after the chemical and steel industries). To make things worse, CO2 emissions from the paper industry are expected to double by 2020. 36% of the average landfill is comprised of paper. Americans discard 4 million tons of office paper each year, which is enough to build a 12-foot wall from Los Angeles to New York City. The pulp and paper industry is the single largest industrial consumer of freshwater. As last week’s blog recommended, there is a lot we can do to reduce our use of paper: reusing shopping bags, printing on both sides, refusing junk mail, using cloth napkins, reusing coffee cups, and by buying products with less packaging. But, sometimes, even when we are doing all of these things, it is still easy to forget the most simple of tasks: buying recycled paper products, especially toilet paper! Sure, it is not as fluffy – but let’s not exaggerate – the recycled stuff does the trick and it is far from sandpaper. And, wouldn’t you rather have a future where we have curbed climate change, still have forests, and have clean water to drink? I don’t mean to sound extreme – but that is what we are dealing with. I’ve said this before, and I’ll say it again: as consumers we have tremendous power to change the world. The day we no longer demand the plushy, soft, and tree-killing kind of toilet paper, the market will no longer produce it. So next time you are faced with the choice – make the earth friendly one. I’m sure your skin will forgive you. If you are having trouble taking the plunge, just think that if every household replaced just one roll (500 sheets) of virgin fiber toilet paper with a 100% recycled one, we would save 423,900 trees! Every 20 cases of recycled paper saves 17 trees, 390 gallons of oil, 7000 gallons of water, and 4100 kwh of energy. It also eliminates 60 pounds of air-polluting emissions and saves 8 cubic feet of landfill space. While it is not always the first thing on our minds as we strive to green-up our lives, buying recycled toilet paper is an important step. In addition to saving old-growth forests, it gives recycled newspaper and office paper an afterlife to look forward to. In addition to 100% recycled, also buy the brand with the highest percentage of post-consumer material and make sure the bleaching process is elemental chlorine free. Check out one of the many buyers guides here.